The church in Jelling, which is placed between the two large mounds, has been build of chalkstone. It has been build about the year 1100. Before this church there has on the same location been three wooden churches, of which the first was build in the period of Harald Bluetooth. The size of the first wooden church was 14 x 30 meters, and therefore somewhat larger than the present church, and it is considerably larger than other wooden churches, from which are found remains. The present stone church had a tower added in the years of 1400. A part of the church burned in 1679, but was rebuild, and since a weapon house has been added, which possibly has given cause for moving of the small runic stone.
. Old picture of Jelling Church, about 1640. In the church's choir you can find the oldest chalk paintings in the country. They have been hidden by crossbows, but in 1874 a part of the choir bows fell down, and then they discovered traces of old chalk paintings. At a restoration of the brickwork in 1978-1979 new possibilities for excavations and examinations occurred . They were lead by Knud Krogh. North of the center line of the first wooden building they found in the ground a grave chamber, which was 4 meters long and 2,6 meters wide. This grave chamber is build at the same time as the first wooden building. The chamber is finished and closed, then it is cowered with a lay of clay, which the floor of the wooden building is placed on. The grave of the king below Jelling Church. As the building of the grave chamber has taken place at the same time as the wooden church has been build, then it is a proof of the fact, that the first wooden building has not been a heathen house, but a church. They have in the layer of clay found remains of burning, and in those they have found tracks from bronze. They think that it may be remains from a melted church bell. All three churches is believed to have burned down before the stone church was build. and has been 177 cm tall. Furthermore they found in the grave chamber about 500 small gold spirals, which probably came from some kind of textile, which has been embroidered with a thin gold thread. They also found two gilded silver ornaments. By closer examinations it turned up that some details in the muster of the ornaments are the so called Jelling-style, which is also found at the silver cup, which was found in the grave chamber in the North Mound. It looks like it is king Gorm the Old. Without doubt he was buried in the North Mound, when he died. Then Harald Bluetooth erected the large runic stone as a remembrance. When Harald converted to Christianity and built a church in Jelling, it would have been naturally to move the remains of Gorm to this church. 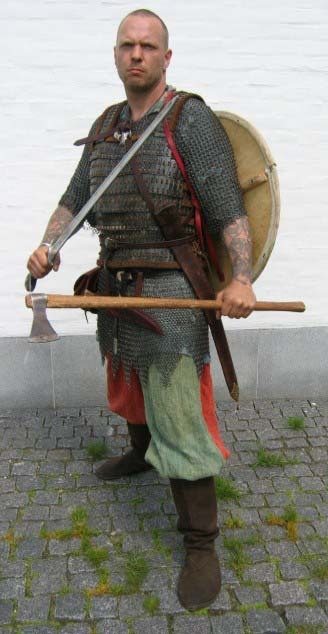 Perhaps because Harald in this way wanted to make clear that he had accepted Christianity. And the grave chamber in the North Mound looks like the buried person has been removed from there. At the times of Harald Bluetooth`s the first church in wood was build in Jelling. Beneath the church floor right in front of the choir bow was formed a grave chamber made of oak wood. In here lay the remnants of a 177 cm tall male, about 50 years old. The skeleton was not complete, and the bones in the grave were placed without natural grouping. The explanation must be so, that the deceased at first was buried at another place, and then later removed to the new grave in the church. Ornaments from the grave of the king. Two silver furnishings from a belt lay close to the dead person. These furnishings are decorated with animal and bird heads, which is typical for the 900-years. The style is the same as the cups and the figures of the birds from the empty grave in the North Mound. The similarities are seen in the technique and the details of the decoration, among other things in the heads of the animals, which have a characteristic curl by the snout. The two graves must have been build within some few years, the chamber in The North Mound probably in the winter of 958-959, and the chamber beneath the floor of the church at the same time as they build the church after the conversion of Harald Bluetooth. The short distance between the two graves and the similarities between the items from the mound and the furnishing from the church indicates that the same family was behind both funerals. The dead person lay in the beginning in The North Mound. Moving of the deceased can have been done at the initiative of Harald Bluetooth as to give the deceased, the first king in the family, a new funeral after the rituals of The Christian Church, and by that link together the power of the king and the new strong belief. The inspiration to this the king may have become from abroad, where prominent persons, like the German Emperor Otto The Ist`s own father was buried in a church. Denmark celebrated officially the millennium in Jelling on the 3rd December 2000. Then the church was reopened after a significant new decoration. The event took place at a millennium service at which Her Majesty Queen Margrethe and Premier minister Poul Nyrup Rasmussen and many representatives from the government attended. stripe where the chamber grave and thus where Gorm the Old is buried. The decoration consist of new benches, alter and kneeler . To the south and east new decorations of the church's windows has been fulfilled, and the lightning in the church consist of 60 smaller lamps. The organ of the church has become a new place, and two new tones have been added. The colors in the church correspond to the existing chalk paintings. 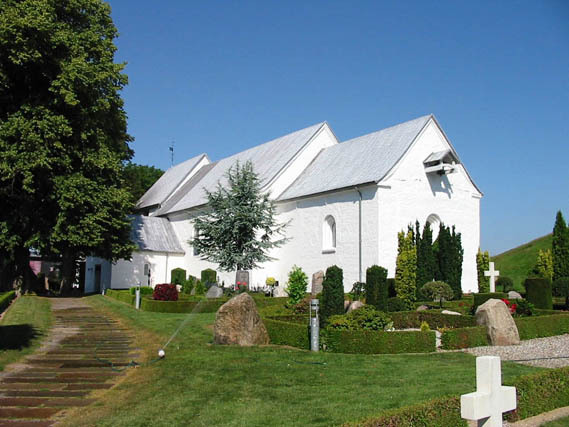 The decoration of Jelling Church has been conducted by the artist Jørn Larsen.